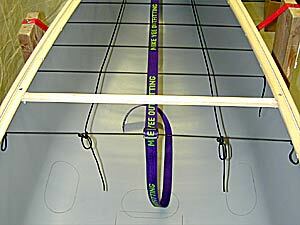 The following sequence of photographs shows the basic process of installing a full position kit with bag cage. 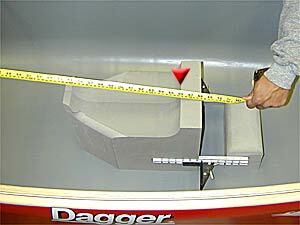 1L Place the pedestal in the boat and measure to the front edge (red pointer) of the back rest. 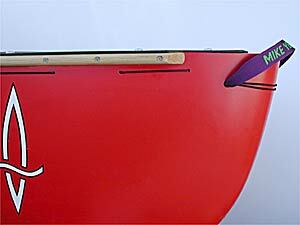 In symmetrical boats the edge should be 7" back from the center point. 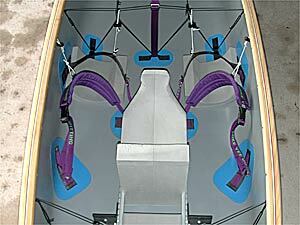 For asymmetrical designs consult with the manufacturer. 1R Center the pedestal from side-to-side. 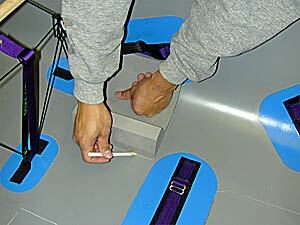 Then trace the outline of both the pedestal and the foot peg block using a China marker (grease pencil). 2L Center the crotch anchor to the pedestal and align edge of black webbing to front edge of pedestal. 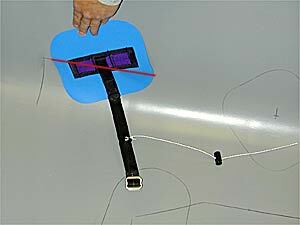 2R Trace the anchor and make orientation marks for use during installation. 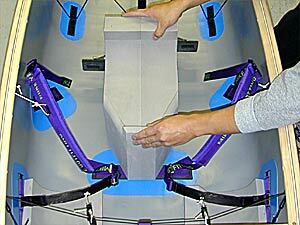 3L Realign the pedestal and adjust placement of the knee cups. 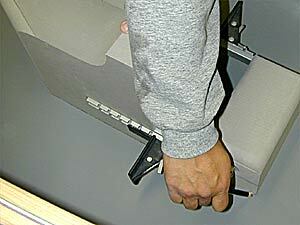 Mark the top corners of each knee cup for knee strap anchor alignment. 4L Determine height of the ankle anchor based on your comfort level. 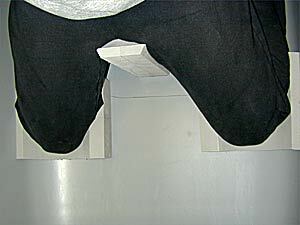 Lower placement offers tighter thigh straps but increases difficulty of escape. Trace the anchor. 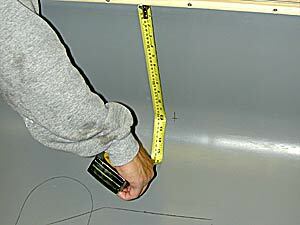 4R Use measurement from the gunnels to align center point of both knee strap anchors. 5L Align knee strap anchor so that the center point is aligned with the top edge (red line) and 1" behind the front edge of the knee cup. Trace the anchor. 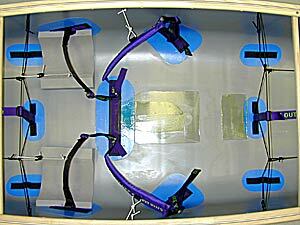 5R Final layout of pedestal, crotch, ankle, knee strap and bag cage anchors. 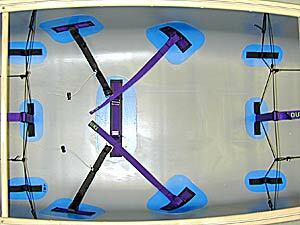 6L Layout bag cage lacing (4" centers), drill holes and install. 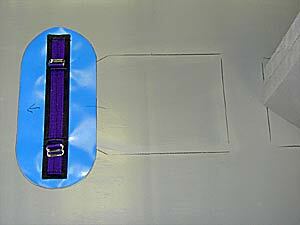 Tie loops (one at each gunnel and one on each side 6" out from gunnels) in the final length of lacing for attachment to bag cage anchors. 6R Side view detail of bag cage lacing, center strap and side lacing attachment. 7L Run 1" center strap and side lacing. 7R Detail of front attachment for center straps & lacing. 8L Clean areas to be glued with Acetone or MEK (methyl ethyl ketone). 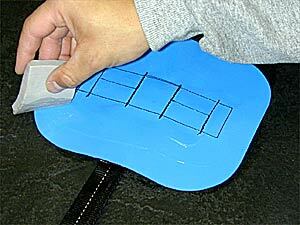 Use sparingly or risk melting the surface plastic. Gloves and respirator are recommended. 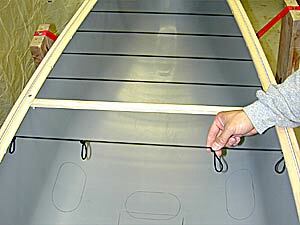 8R Apply two thin (let both 1st and 2nd coats dry) coats of Vynabond or Stabond adhesive to (each) anchors and the hull. 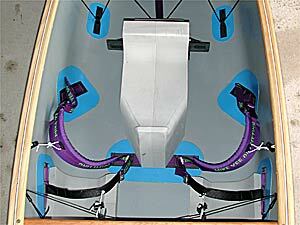 Do not over apply to hull—too much adhesive will eat into the Royalex. 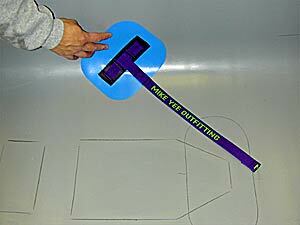 9L Use a heat gun or hair drier to warm glue surfaces just before bonding. 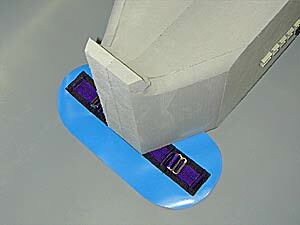 This will improve adhesion. 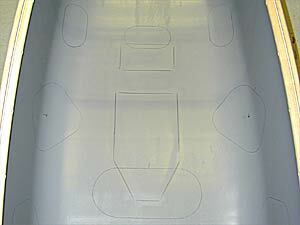 9R Position each patch and apply firm pressure to bond. 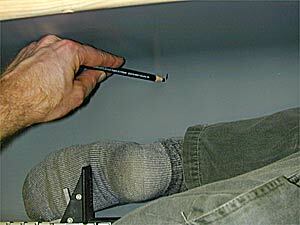 Use a small roller or wooden dowel to work out any air bubbles and ensure full surface contact. 10L All anchors glued in place. 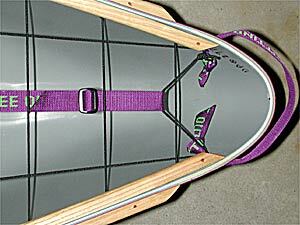 Note the completion of the bag cage and center straps. 10R Replace knee cups and fully trace for gluing. 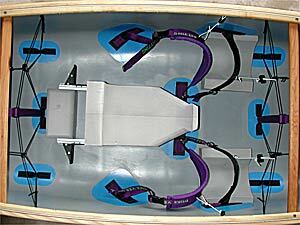 Apply two thin (let both 1st and 2nd coats dry) coats of water proof contact cement to each knee cup and the hull. 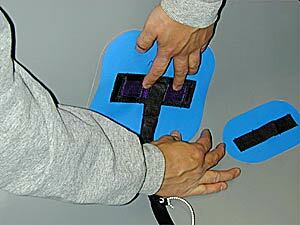 11L Position knee cups and use firm pressure to bond. 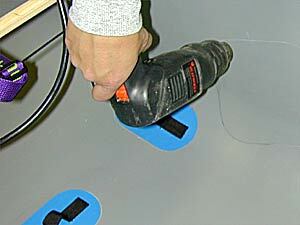 Use the same gluing technique for the pedestal. 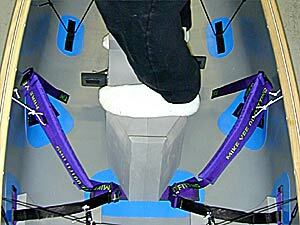 11R Position pedestal and make contact. 12L Carefully stand on the pedestal to ensure full bonding. 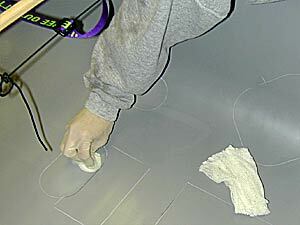 Allow everything to set overnight before stressing the bonds.